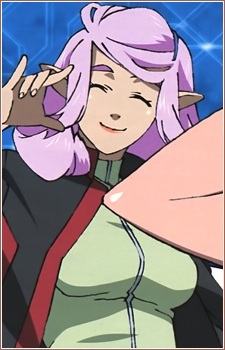 A tall (by Zentradi standards) pink-haired Meltlandi who is part of the all-female S.M.S. Pixie Squadron. A calm, gentle and kind character. She remained in the Frontier fleet along with Clan, Luca and Alto during the recent S.M.S. desertion. She is seen on the surface of the Vajra home planet in macronized form carrying Clan Clang in her left hand's palm after the human-Vajra conflict subsided.